Crocheting a circle is very simple. The basic idea is to start with a small loop and continue to increase the number of crochet stitches each time you crochet around the loop. By increasing the number of crochet stitches in a easy to follow, symmetric pattern, you will create a flat circle. Crocheting in a circular fashion is great for creating household items such as pot holders, dish clothes, facial scrubs, and coasters. 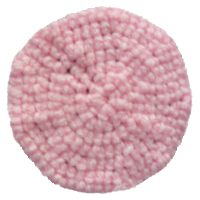 Crocheting a circle is also a primary way to start patterns for hats, beanies and dolls. To learn how to crochet a circle, follow the simple pattern below. Any size yarn and crochet hook can be used, since circles come in all shapes and sizes. To Crochet a larger circle, do not slip stitch and finish off in round 7, instead continue with this pattern until your circle is of desired length. You may also want to try using different crochet stitches, such as double crochet, to get a different look. Changing yarn colors can also give a very pretty pattern, such as stripes or checkers. If you need further explanation for how to crochet a circle, leave a comment and I would be glad to help! This entry was posted on Saturday, February 7th, 2009 at 8:12 AM by Rachel Choi	and is filed under Free Crochet Patterns, Tutorials and Help. You can follow any responses to this entry through the RSS 2.0 feed. You can leave a response, or trackback from your own site. I’m so happy happy that u put a circle pattern, I’m trying to make a lady bug hat.Do I need to slip stitch after I chain 2 in rd 1. You don’t have to slip stitch in round 1 after you chain 2 because you will be making 6 single crochets in the second chain from your hook, which will create the very center of your circle. Good luck with your lady bug hat! does this spiral or do you slipstitch at the end of each circle. When I do that, I see a “seam” through the circle where the slipstitches were. HELP???? This is especially true when doing a hat like this, I get the look of a seam up one side. Hi Sarah, this pattern is made in a spiral. You do not slip stitch at the end of each round. Hi Rachel…is this considered “working in the round”? I am searching for a clear example of those instructions and came upon your how to crochet a circle. I’ve got most of the basic crochet stitches down and several beginner blankets behind me, but “working in the round” has been in some of the basic cowl and hat patterns I’d like to move on to. I appriciate your guidance in advance. Thanks! Hi RL, yup this is working in the round. Anytime your crocheting round and round in a circle, it’s working in the round. How would I do this using double crochet (UK– treble) stitch, I’m not that good at working out patterns. Hi Anne, to work the circle in double crochet, try starting with 12 double crochets instead of the initial 6 single crochets that the pattern states. Then you’ll work the rest of the pattern as written, but using double crochet stitches instead of single crochet. Thank you…of to practice this. But first, have to find wool, coddy catty has just hijacked ball.lol. This is the Best Pattern, so easy to truly understand. Thanks so much; you’re wonderful! when I crochet a circle, either way spiral or finish each round and sl and then chain to start the next- I always get holes in fabric. At first I thought it was happening in the row above an increase, but there doesn’t seem to be a connection. I’m making hats and mittens and they turn out fine except for these holey bald spots. I’ve taken yarn and needle and closed them up I’m doing a mitten right now, and I’ve found that if I stitch into the post instead of the space that it looks better. But I’m getting a ridge on one side. Can you help me? I cannot figure out what I’m doing wrong. This doesn’t happen when I crochet straight rows, by the way. Hello! It’s hard to say since I’m not there with you and can’t see your work. Maybe if your tension isn’t consistent it can have some loose stitches that create the holes. Maybe you are accidentally skipping stitches. I don’t know if you can help me but I’m having trouble with my circles. I am making 4 rounds (12,24,36,48) and when I end I count 48 double crochets but seem to always have 1extra stitch (or loops) when I count them from the top. It’s messing up the pattern I have to make a square around the finished circle. Hi Sandra! When you are at the round that finished with 36 stitches, try placing a stitch marker (scrap of yarn or paper clip, etc) into every 3 stitches. You’ll have 12 of these markers so you know that everything is correct. Then work round 4, and each time you work into a set of 3 stitches you should be making 4 stitches (2 double crochets and 1 increase). If all goes well you’ll have 48 double crochets when you are done. If not, maybe the stitch markers can help you determine where you are accidentally adding that extra stitch. Rachel, I am really enjoying the simplicity of using the 1/2 circle at each end of the rectangle . The only thing that seems wrong to me is that as the circle is expanding, the increases are starting 6 or 7 sts before the rectangle ends and end 6 or 7 sts before the rectangle begins. I believe this is because the head of the stitch is to the right of the stitch and because the work is not turned. How do I correct this. Or does it not matter. Hi Sylvia! You can try turning your work after each round. It is natural that the stitches will get pulled towards the right if you are right handed, or left if you are left handed, if you do not turn the work. Hi Rachel I just made sure that each increase pair lay directly above the pair in the row below. I also noticed that the extra sts. moving into the rectangle was happening on both sides equally so it balanced out. I now have a beautiful placemat. Thank you for the clue about the two half circles. PS. I only do 2 chains for stepping up dc’s. .I also start the rounds in middle of the circle. 3inc’s……work the round …….then 3 inc’s……then 2 ch to step up.